What are you using for Mythic @Kai_Mulai ? The teams that work well for mythic seem more limited than what works for the lower levels. A stun palp. He's going to one shot whomever he attacks. B Get someone to taunt. The RG get insane TM gain between themselves and EP, so if there's a slow taunter like Kanan they're just going to chain stun him. They deal no damage and he regains health and prot when hit anyways. C (and this took me a minute to figure out) - once EP is stunned don't keep attacking him. Start taking out the RG. Their health buff is going to keep EP upright, and they don't have a lot of health. Once two or three of them are gone you're going to have a much easier time. Just keep EP stunned. 2 starred it on Saturday, and 1 starred it on Sunday. I don't think even a 85/g12/zeta phoenix would do bonus/mythic. Probably need a clone team (hello rex) or a wiggs team. 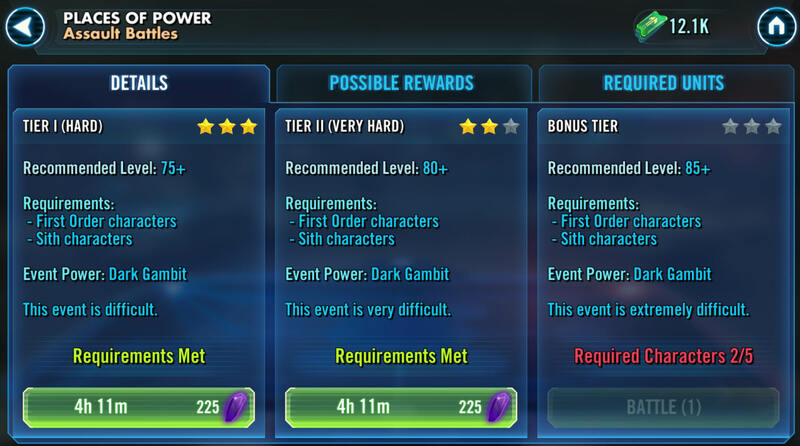 No, maxed out zeta phoenix can do the bonus and the mythic as a guild mate of mine did it, but a lot of people used either a CLS or zeta Jyn lead with Zolo, Chaze and a 5th. R2 and Fulcrum were popular to use as the 5th. Those are the teams used by my guildmates who beat mythic. I was using my Phoenix team, since they’re currently my only light side team able to take enough damage to last. They removed "Achievements"?! Whyyyyyy??!! I look Forward to those! They don't remove - they moved. It's under quests on the left side of the window. You have daily/guild/achievements from top to bottom. @Trystan_Spyder, Okay, found it. Thanks! That mythic tier is aimed at end game players @Amaze. For example, I used a cls lead, R2, Raid Han, chirrut and baze (chaze). All are gear12, cls has 2 zeta's, r2 and han have 1 each. Think of the mythic tiers as achievements, they're something to work towards. I think he was trying tier 2 though. Yeah, I was trying tier II, but thanks anyway. Its probably an old player who has quit the game but been picked for you by the ai. Zeta maul lead used to be the meta team in the game. No, they pick teams that are by their calculations slightly more powerful than yours. Unfortunately those calculations don't take into account zetas or the synergy between teams so occasionally you'll get thrown a curveball like that. On a side not, you don't have to be playing for years to beat someone who's been playing for years. After a while a team is as strong as it's going to be. 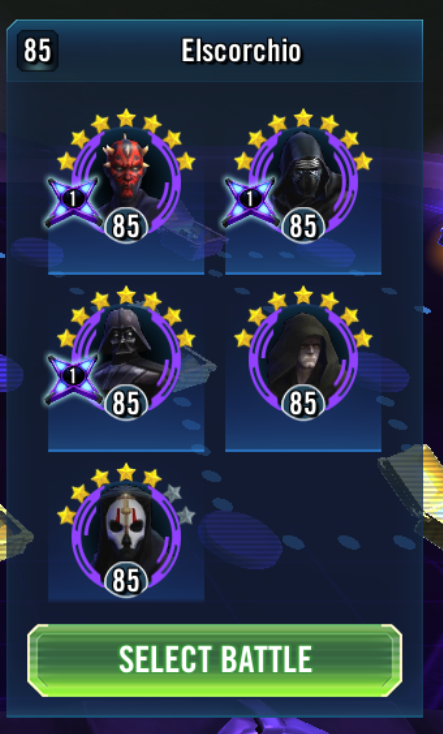 I don't think there's a possible combination of toons that I couldn't beat on node G12, and that's all because I have one strong team. To add to that, GW was recently nerfed pretty hard, so it shouldn't take as long post 85 to get easy wins. But the thing is, GW was never MEANT to be won handily everyday. There's a reason winning 150 of them is an achievement. There's a reason you can't reuse dead characters and why characters you've used retain their previous health and cool downs. The point of the exercise is a long drawn out war where you are supposed to make use of all your roster. When I first started encountering zeta teams, a node 12 Zaul squad like the one you see took me 7 teams to defeat...that was my first victory against such a squad. As my roster strengthened, I could defeat a tough meta node 12 with four teams. Then two. Then one. This was all before the nerf too...so you will get there. It is probably past time for you to look into diversifying your roster more rather than max out Phoenix. It was good advice for a starter squad, and there is something to be said for not stretching yourself too thin, but you need to have a variety of geared teams. Two characters that work well against such Zaul squads are Rex lead and R2-D2. 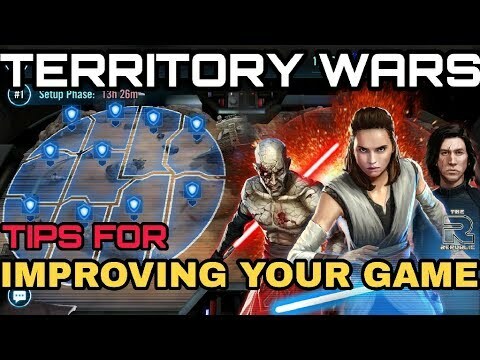 You could also build a team with some tanks such as Old Ben and Stormtrooper Han around a levelled, hard-hitting character with good accuracy. You might also try a Nihilus-lead Sith team (which can't crit and trigger their stealth) and put accuracy mods on some characters if you need to. Another trick is that if you take out Darth Maul, the next team you send in will not have to face his leader ability at all. I'm sure others must have also told you by now of the strategy of preloading turn meter on multiple teams. I encountered something today. I seem to meet all the character recommendations, in fact they are the Same Characters as Tier I & II, and I am level 85 (there IS no level 85+, 85 is the max) so Why won't it let me do the Bonus Tier?! Pretty sure you need 7* toons for the last one, maybe that's it? @Kivrin It's just that it is not Stated. I think that the legal criteria would be, if it has to be Assumed, then it does not count; it has to be clearly Said. Or something like that. First tier requires 3* characters (I think). Second tier requires 5* characters. Bonus tier requires 7* characters. You’re right that they should say that, but they don’t. Ahhh.....But thanks for the support. Simple answer: you got lucky before. Or, as folks say here on the forums, RNG (random number generator). The battles will go a bit different each time depending on which character the computer attacks, etc. Ive lost trck of what your team is but if your team is marginal wave 8 of the battle depends on landing something debilitating (mass shock or something maybe) before the yoda uses tenacity up. Whether you succeed or fail depends on how much turn meter your character that can land somethibg major finishes wave 7 with. I think the reason the text doesn't specify 7* chatacters is because the star requirement is a recent addition that happened the last time this event came around. I have been playing this all this time by just throwing some toons in there and hoping for the best. Finally, I have decided that I needed to know more about this, now that I can finally rest a little from all of my Endless farming (I finally have a near unbeatable Gear 10 Empire team and my Phoenix team is all 7* Gear 10). So @Sunnie1978, one of the more knowledgeable and infinitely helpful moderators, sent me a link that I have been looking at off and on for the last couple hours...I think it is going to help immensely! Is there a procedure in place whereby I can record my squad and fleet fights for training purposes? Not in-game but there are various apps you can use to record your screen. I can't suggest any because I haven't used them, but a quick Google should help you. I found an app called DU Recorder, which I liked. @crzydroid, Unfortunately I am using an Android Emulator, and playing on my Samsung Flatscreen. When I attempt to use the DU Recorder, it says it is not compatible with my device.